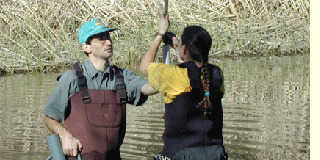 Andy Fisher's research group explores water-rock interactions in many settings. In one set of ongoing studies, Fisher and his students and colleagues have investigated the mechanisms by which enormous fluxes of water move in and out (and through) the oceanic crust, using field observations, laboratory experiments, and computer modeling. The ocean crust is the largest aquifer on Earth, holding a volume of water about equivalent to that in ice caps and glaciers, and flows through the crust are at least as large as flows from rivers into the ocean. Recent studies by Fisher and colleagues have shown in recent studies that seamounts, tens of thousands of (mostly inactive) underwater volcanoes that dot the seafloor on a global basis, provide conduits through which enormous quantities of fluid, heat, and solutes pass between the ocean and the underlying lithosphere. 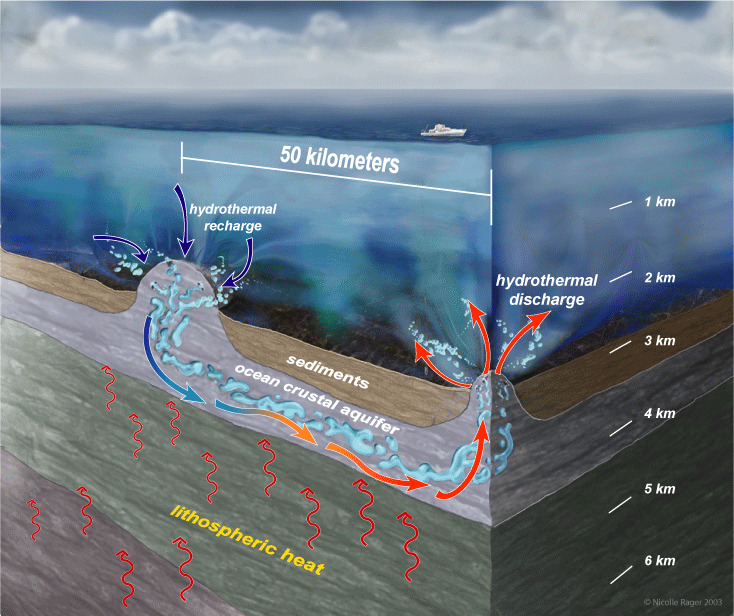 Fisher is also the lead investigator on an international effort to install a three-dimensional network of subseafloor observatories to be used for the first controlled, cross-hole experiments attempted in the oceanic crust, including hydrogeology, tracer, geophysical, and microbiological components. Fisher's research group is also exploring surface water-ground water interactions using heat and conservative and reactive solutes and nutrient isotopes as tracers. One recent project involved quantifying stream contributions to aquifer recharge and the dynamics and impacts of stream-aquifer flows on water quality in the nearby Pajaro Valley. New projects involve linking hydrology and nutrient cycling in constructed wetlands, nutrient dynamics within the San Joaquin River as part of a CALFED project, and evaluating the efficacy and influence on water quality of an aquifer storage and recovery project adjacent to a wetland. For more information on these and other studies and to learn about potential opportunities to join or collaborate with the UCSC Hydrogeology research group, please see Andy Fisher's Hydrogeology web page.